A number of players from Tim Sherwood’s “Development Squad” (this name seems to be catching on across the football world!) have made their first team debuts this season, so it seems a good time to consider the progress of some of them. Livermore is proving me wrong. I had totally written him off as a Spurs player, and was surprised when Redknapp started to use him in the first team squad in pre-season. I always felt that in the U18s and reserves that he lacked technique and genuine footballing ability, and was primarily making faster progress than others due to his physical attributes. Whilst he is clearly not the best technically, he has shown that he is, at the very least, competent and reliable in his Premier League and Europa League appearances. He is keen to get on the ball when we have possession, but also not afraid of puting in a shift and doing his share of the dirty work. His main strength is still probably his physicality – he’s big, strong, and has good energy levels – but he has also shown good positional awareness and showed in his goal against Hearts that he does have some footballing ability too! I still don’t see him becoming a Spurs regular, but he should certainly be able to carve out a Premier League career for himself. There have been many comments from fans, the media and Harry Redknapp about him looking like a boy, but Carroll plays the game like a seasoned pro. His touch, movement and awareness are excellent – always looking to make himself available to receive the ball, and then quickly distributing it, before he again looks to find a suitable space. When he loses the ball (which has not been too often in his performances for the first team so far), he doesn’t recklessly dive into a challenge – instead, he puts the maximum effort into getting back behind the ball and stopping the opposition from playing. One criticism so far would be that he has perhaps kept it too simple – his passing range is such that he should perhaps look to be a little more ambitious at times but, on the other hand, it’s totally understandable that he would look firstly to play himself into a game with simple passing, and secondly, look to impress the manager with his ability to keep the ball. Whilst I rate Carroll as an excellent prospect, we must be patient with him – look at Manchester United’s handling of Tom Cleverley (who is three years older than Carroll) as a comparison – he had lengthy loan spells before getting a chance in their first team. Having made a superb goal-scoring debut in the FA Cup match against Charlton last season, Townsend impressed on loan at Millwall and will certainly feel that he has earned his chance in our first team. He will be disappointed, however, that most of his opportunities have come at left-back, with Danny Rose out injured and Assou-Ekotto rested. However, he came on and really influenced the game when given his chance on the wing against Shamrock Rovers, getting an assist and generally looking lively. I am not sure whether he will feel that he may have been better off going straight out on loan this season, or whether he will be pleased to have had first team football for Spurs in any position. There is plenty of the season left, so he should still get a loan move – hopefully to a lower-half Premier League team, or an upper-half Championship team – where he can continue to progress. Fredericks was on the bench for the first team in the 2009/10 season in the FA Cup Fourth Round replay against Leeds, but soon after he picked up a long-term injury, which meant him missing the majority of the 2010/11 season. To start against Hearts in the Europa League, then, must have come as quite a surprise – he was barely back to fitness! Fredericks is blessed with natural pace, and has good close control and crossing ability, although he didn’t really get much of a chance to showcase much of his attacking play in his second start (against Rubin Kazan), which came at right back, a position that he has occasionally played for the Development Squad. He will be looking for more involvement in the Europa League, before heading out on loan in order to get some league experience and to build up his strength and fitness. The youngest of all of our players who have been involved with our first team squad this season – he only turned 18 at the end of July, a month before his first team debut. He did OK in his debut, although was left wondering what could have been, missing a penalty that he had won himself. In his second appearance he was very unfortunate not to win another penalty and was instead incorrectly shown a yellow card for simulation. Kane has an ungainly style, but his touch is good and he has plenty of strength for one so young. He has scored goals at youth and reserve level, and also had a reasonable scoring record for League One side Leyton Orient last year. I think a lot of fans were expecting more from him in his Europa League showings, but it is important to remember that he is still very young and inexperienced – time is on his side. Parrett made his debut against Shakhtar in February 2009 – he put in a very tidy performance in that game and will feel a little unlucky that he has not seen more first team involvement, making just three further substitute appearances. Parrett will hopefully get a chance in the remaining Europa League matches, but the emergence of Livermore and Carroll, plus injury problems of his own, have meant that he has found himself (rightly or wrongly) a little way down the pecking order. An all-action player, Parrett possesses great drive and no little technique, with good all-round football ability. He turns 20 soon, and will certainly be looking for first-team football this year, be it for us in the Europa League or on loan. A number of fans have been questioning why the likes of John Bostock, Massimo Luongo, Cristian Cellabos and Souleymane Coulibaly are not involved in the Europa League. In order to qualify for the UEFA “B List”, a player must have been born after 1st January 1990 and have been registered with the club for two years since his 15th birthday. This obviously rules out the likes of Luongo, Ceballos and Coulibaly, all more recent signings, but also Bostock due to his loan spells away from the club. They could have been named in the main “A List” (as Iago Falqué, Giovani dos Santos and Jake Livermore were), but that would have to have been at the expense of first-team players. 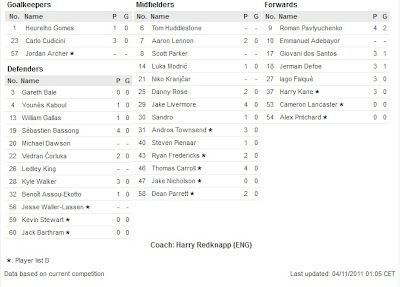 To illustrate, here is the squad list taken from the UEFA Europa League website. Ben Alnwick, 24 – currently on loan at Leyton Orient as cover for the injured David Button. He has made five appearances so far. Jordan Archer, 18 – on loan at Bishop’s Stortford and performing well – he is also a recently call up to the Scotland U21 squad. David Button, 22 – was having a good start to life on loan at Leyton Orient until he picked up a shoulder injury in September. Oscar Jansson, 20 – playing on a near-weekly basis for the Spurs XI (reserve team) following the completion of his loan at Bradford. Mirko Ranieri, 19 – on a season-long loan at Italian side FC Esperia Viareggio, presumably with one eye on a permanent move. Nathan Byrne, 19 – had started to settle after a tough opening spell at Bournemouth, but suffered a serious ankle ligament injury and will miss a couple more months of football. Steven Caulker, 19 – was playing consistently well for Swansea City prior to his knee cartilage injury, but is due back soon. Bongani Khumalo, 24 – having initially been a regular starter at Reading, he has found himself down the pecking order of late, and is fighting to get his place back. Kyle Naughton, 23 – a regular starter at right-back for Norwich, with a decent level of consistency to his performances. Adam Smith, 20 – has been performing very well for MK Dons, and recently picked up three MOTM awards in a row (one having scored a superb goal). He has recently been called up to (and played for) England U21s. John Bostock, 19 – has been playing in some of the NextGen Series and for the Spurs XI. Cristian Ceballos, 18 – scored the opener in the 4-1 win over PSV in the NextGen Series and for the Spurs XI. Yago Falqué, 21 – on a season-long loan with an option to make the move permanent, he has been heavily involved in the Europa League and has shown flashes of good play without ever really influencing a match. Massimo Luongo, 19 – made his first-team debut, coming off the bench in the League Cup game against Stoke, and unfortunately missing a penalty. I think he will get more chances this season – an impressive player, and one to watch. Ryan Mason, 20 – on loan at Doncaster although he has again seen his loan spell disrupted by injury problems. Doncaster have changed their manager (with Dean Saunders taking over) and so we need to wait and see whether he’ll be involved in their first team on a regular basis. Jake Nicholson, 19 – has played in NextGen Series matches, Spurs XI matches, and came off the bench in the Europa League – he will certainly be looking for a taste of league football this year. Alex Pritchard, 18 – one of the stars of our NextGen Series team so far with some excellent performances, and he has also been an unused sub in two Europa League games. Jesse Waller-Lassen, 18 – still getting over injury problems, although nearing full fitness – I’d expect that Jesse be given time to get up to speed with appearances for the Spurs XI. Simon Dawkins, 23 – returned from a good spell with San Jose Earthquakes in the MLS – he finished an impressive 21st in the Castrol Index Player of the Season rankings (his team mate Chris Wondolowski was 1st, Thierry Henry was 3rd, Landon Donovan was 16th, Juan Pablo Angel was 25th, David Beckham was 69th). Cameron Lancaster, 19 – scored a good goal for the Spurs XI last week, and was on the bench for the Europa League match with Rubin Kazan. Jonathan Obika, 21 – still on loan at Yeovil, although just on his way back from injury. Kudus Oyenuga, 18 – involved in some of the NextGen Series games, and some Spurs XI games, Kudus will be looking for more league experience after he only got a few brief appearances at Bury. Souleymane Coulibaly: I keep looking for info on him in on the club website, and there isn't even a pic of him. Would be grateful for an update. No problem - he played in the Spurs XI's 3-1 defeat to Palace at the start of November, and has started all four of our NextGen Series matches, scoring three. Great article, really balanced view & good insight into the potential we've got to come through the ranks. If you're a real Tottenham fan we should all contact the prosecuting QC in Harry's case and generally make his working life a misery and make them have to change their contact phone numbers and email details for all the spam and marketing calls we shall send them for trying to mess with Tottenham’s best manager since El Tel. after his goal against Barcelona over 2 years ago. He seems to have the mental as well as the physical presence. He also plays very well with Carroll. Rose,Townsend and Fredericks seem to have the confidence as well as the skill. Most promising times for youngspurs for many years. Good incisive balanced article as always. Are you able to add a few lines on the players in the NextGen games who you have not mentioned already plus (because we are so short of young defenders coming through) assess some of the other Academy defenders such as Ekomg and Sheriff ? Cheers for the update Windy, I always like these. What's the deal with Yago Falque, I hear his parent club bought him with high hopes and have been very restrictive with clubs that could loan him, like us with Walker as I heard it, that doesn't sound like a setup that would include a buying option. Has there been a change of heart with regard to him over there, or a change of management structure? Thanks for this! I think we will/should see the best of Carroll and Livermore as a partnership with an out-and-out anchorman behind them. Both appear more dynamic going forward than their European displays would suggest. On the other hand, given the preference to keep it simple and dictate play from a deeper position, I think they would also benefit with a deep-lying number ten in front of them a la Van der Vaart. It's pleasing to see so many technically accomplished players on the fringes/waiting in the wings. Their biggest obstacles are now predominantly mental i.e. persuading the men that matter that they have the right stuff and adapting to Redknapp's occasional tactical inflexibility. Davspurs - cheers, my pleasure. I rate Stewart (CB or FB) and Barhtram (RB), and I also think Ekong is worth keeping an eye on. Veljkovic is a player that many are excited about too - think he's only just turned 16, highly promising. Anon @ 23:47 - cheers, appreciate that. 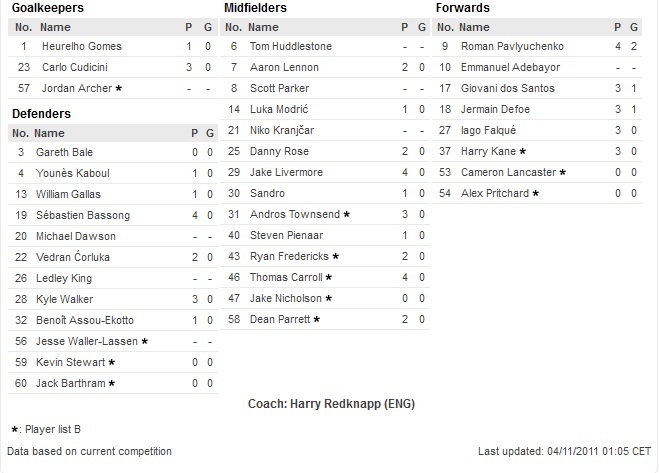 Anon @ 00:53 - there are U18 games (FA Premier Academy League & Youth Cup starting soon), NextGen Series games, and our behind-closed doors friendly which the "Spurs XI" (i.e. Development Squad) play in. Anon @ 05:42 - not really sure how that would help - if anything, it'll annoy him into a convinction! Jimmy - Totally agree - the future is brighter than it has been for some time. bonse - cheers as ever. I think Yago was always "with a view..." and I read that a deal is in place should we want to "trigger" it. I think he's got good technique, but does seem very one-footed (like dos Santos). The move that you mention was a great one - I wasn't sure it was out tbh. JS6 - Totally agree about the number 10 - just a same that Mason is currently out on loan, as I feel he'd have shone in the Europa League. I like the idea of Carroll and Livermore sitting deep in a 4-2-3-1 as they are pretty much opposites! Who do you think is Spurs' brightest youngster? Tall Texan - very hard to pick one. I'd probably plump for Caulker, though. hello, what about Tomislav Gomelt(sp? ), the lad who scored a hatrick in the NextGen Inter drubbing? any news about him? He should play on Wednesday I think... looking forward to seeing him for the full 90 this time! Nice post. I was checking continuously this blog and I'm impressed! Very helpful information particularly the last part :) I care for such information a lot. I was seeking this particular info for a long time. Thank you and good luck.